There’s some things about motherhood that nobody ever tells you about. Sure, you get the poop stories, the up-all-night stories and the warnings about your own impending memory loss, a.k.a. “mommy brain.” But other traps in The World of Mom you are left to discover on your own. I have recently found out that not only are you doomed to constantly compare your two children, sometimes the comparison can be painful. Lydia spoke her first word, clear as a bell and on her own initiative, at twelve months old. As Sam neared that same age, Lydia’s milestone stuck in my mind and I waited to see if Sam would begin speaking around the same time. Twelve months came and went, but no worries. He’s a boy, second sibling. Plus, he’s about to get tubes in his ears. Sam would grin. It’s fine. Lydia got tubes in her ears at eleven months so she had more time to adjust her hearing. “AHHHHH,” said Sam. We’re still okay. Sam’s a boy and they mature later than girls, didn’t you know? 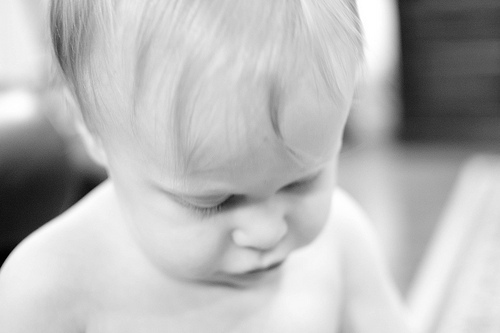 At fifteen months, Sam had his checkup with the pediatrician. The doctor asked a few questions about words and communication which I had no positive answers for. I had noticed Sam was not talking, but now it was brought to my attention that he simply was not communicating. He does not point, he does not bring things to me. Lydia pointed so much when she was his age that I wrote a post about it. A little red flag went off in my brain. But it’s okay, right? He’s a second sibling, he’s letting Lydia do the talking for him. Just make sure you read more books to him. We’re still okay . . . The little red flag in my brain didn’t go away, and one afternoon I did a no-no in the Mommy World — I Googled symptoms on the internet, only to see a lot of what I knew I didn’t want to see. Between the many links discussing autism — and I’ll tell you right now we don’t think Sam is autistic — I did find some helpful stuff. Fear not — The Government is here to help. I called the Early Invervention system and set up an appointment, which led to an anxious wait until another appointment this morning. This morning’s appointment was an evaluation to see if Sam qualifies for services through the Early Intervention system. Sam loved it because he got to play with new toys for an hour. I loved it because we were finally getting somewhere — he’s either in the system or he’s not. The EI people called me back quickly and Sam is qualified due to his delay in communication skills. They did note how social he is, so that makes me feel better about the is he/isn’t he autistic part. As the speech pathologist explained, Sam needs to learn that his voice has power, it enables him. That hasn’t clicked with Sam yet. And so we begin another odyssey into the depths of a new frontier with our Sputnik. Perhaps in a year or so I will be hearing Sam taunt his older sister because he can throw a ball better than she can. Because, you know, he already does throw a ball better than she can. Boys, amirite? So glad you are getting some help. Eli was a very late talker and we did a bit of speech therapy after his second birthday. Now we look back and laugh at us wanting him to talk so badly and now he never stops. Never stops.